Bank of America to create troubled loans unit, wrote Nelson D. Schwartz at the New York Times (here's the original, at least until it disappears behind a paywall). "financiers of state"? Earlier in the article, he talks about how big business manages to reduce its tax burden so that it's the middle class who end up carrying the burden. So, if they are avoiding paying taxes, how are they the "financiers of state"? "obligatory" that they have power because they are required to pay taxes? This may be the most ridiculous of all these silly statements. Paying taxes does not oblige a government to favour one citizen over another. At the end of the day, each "citizen" of voting age gets one vote, and corporations, no matter their citizen-like status (which is not the same as citizen status), have no vote in electing government officials. There just no connection between paying taxes and exercising a citizen's right to vote. The Saunders article, on abolishing corporate tax, is not what this post is about. But, when I read it, I was reminded of the second article from a few months before. I found the Saunders article interesting because of his associating paying taxes with "citizen-like status." The thing is, corporations enjoy the benefits of being a "separate legal entity" for reasons that have little to do with avoiding paying taxes.And that's the segue into the Schwartz article on Bank of America. a sole proprietorship is a person who is doing business as him- or herself. It's great that the books and financial performance are private, but it's not so great that the proprietor retains full liability - if the business acquires debt, the proprietor's personal property can be liquidated to pay it if the business runs out of cash. a partnership is a get-together of sole proprietors who share equally in the business. It's great, again, that these organizations are private, but it's not so great that not only is a partner's personal assets exposed to liability if the partnership incurs debt, but if a partner runs up company debt other partners did not know about, their personal property can be liquidated to pay it if the business runs out of cash. In both forms of organization above, the owner(s) is/are responsible for their business decisions because the business and the owner(s) is/are one and the same. a corporation is a separate legal entity that, as such, enjoys limited liability. That means if the business runs up debt, the corporation alone is responsible for that debt, and the personal property of employees cannot be pursued to pay any debt in excess of the corporation's assets. That's great. What's not so great is that a corporation is, essentially, a public company, meaning its financial performance must be made available to public scrutiny. That's not so good...but there are ways around that. In other words, a corporation — not the human being executives who actually made the bad decisions, but the corporation itself — is now responsible for its own bad decisions. Some will argue that this is necessary to unlock creativity and allow businesses to take risks without fear, to drive growth, productivity and progress, an argument not without merit. Whatever the case, the issue here is that a corporation is responsible for its bad decisions, and assets in the corporation are liable to be liquidated to satisfy its debts. 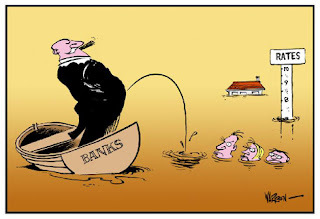 "Ever since the 'good bank, bad bank' concept was introduced by Mellon Bank in the late 1980s to cope with a raft of troubled real estate and corporate loans, dividing a financial institution has become a fairly routine part of the Wall Street playbook". Bank of America is trying to "distance itself from...troubled assets that...continue to hang over the company." Unbelievable. Bank of America is a corporation, a separate legal entity, which is responsible for its decisions. The billions of dollars of troubled assets hang over it because it made decisions from which the mess directly precipitated. That's what the organizational structure is about. How do they get around it? Why, they go ahead and make another company, and dump the toxic assets into it. Follow me here. The executives, human beings, who made bad decisions, created the concept of a separate legal entity corporation they could blame, independent of them. Having that in place, it didn't provide enough of a buffer; so, they create yet another separate company to further distance themselves, and this has now become a "fairly routine part of the Wall Street playbook". Routine? So, they keep making mistakes, keep creating clouds of trouble over their heads, and keep avoiding accountability by pushing the problem further away from themselves to the corporations they run, to new corporations across or down the street...they've become accustomed to doing this as a matter of routine. What, then, happens to accountability? Who pays for the bad decisions? The curious and patently absurd notion that a corporation, as a "separate legal entity" absolves the liability of the real human beings who made bad decisions (as though bricks and dry wall can make stupid decisions) was one thing. But, having been established that this separate legal entity is liable for decisions that humans made while under its employ, the Ought Thought here is that these liable corporations should not be allowed to "spin off" the financial albatrosses of their bad decisions, while that corporation, still sporting the bad-decision-making human executives, can continue sans liability. There's also a religious connection to make here. On the Jewish calendar, there's a holiday called Yom Kippur - the cleansing of the sanctuary, the day of atonement, judgment day. Back in ancient Israel, throughout the year, sinners would approach the sanctuary, confess their sins at the altar of burnt offering, and a lamb would be sacrificed their at the altar, symbolically dying in place of the sinner. Then, the priest, by sprinkling the blood of the animal, symbolically "transfer" the sinner's sins from the altar into the sanctuary. This would go on daily, throughout the year. Once per year, on the day of Atonement, the high priest would enter into the most holy place of the sanctuary, and sprinkle blood from inside back out into the courtyard where the altar of burnt offering was, and then sprinkle blood on a scapegoat which would be released out into the wilderness, symbolically taking with it all the sin that had been in the sanctuary all year, ridding the sanctuary and the camp of the sins, cleansing the sanctuary and, by removing the stain or the mark of sin, judging Israel. The scape goat was designated as being "for Azazel", meaning "one sent away" or "strong one against God". The idea that would come from this is that sin had been transferred upon the head of the strong one against God, or the demon himself, who was responsible for sin in the first place. Transferring of responsibility is about returning responsibility to the one who is responsible. What these banks are doing as a matter of routine is transferring their responsibility further and further away from themselves. They've got this backwards. Perhaps, then, I should propose a new Ought Thought - like the transfer process in the spiritual economy of ancient Israel, the path by which sin finds its way back unto the head of those responsible, is convoluted...but it gets there eventually. In the meantime, g'mar chatimah tovah. Responsibility is a four letter word on Wall Street. But what do you expect when you hand a bunch of men the keys to the printing press and tell them its ok if you lose all that money. I agree we need to change the rules. We need to make sure that these corporations are held responsible for their mistakes. Either that or let me create a "straw man" john and give him all my debt. Indeed! But, if you created that "straw man John" you'd get a lecture about being responsible, living within your means, etc. If you're a banker, you get to enjoy no lecture, bailouts financed by the folks getting the lecture, and even bigger bonuses. They've got it backwards, but the correction is coming.